It’s that time of year again when Gallen CS will proudly present its 26th annual musical . This year the stage adaptation of Charles Dicken’s timeless classic “Oliver ” returns. Mr. Micheal MacCartain is once again our Producer and Set Construction and Design and his multiple talents will once again lead to a wonderful theatrical spectacle. Mrs. Derval Scully is our Choreographer bring her expertise to the role. Mrs. Evelyn Breen is Costumes Director with Ms. Josephine mc Keogh as Director of Set Painting and Design with Ms. Heather Bracken stepping into the role of Musical Director. Rehearsals are in full swing .Ava o Connor plays Oliver with Cailum Woods as the master thief Fagin. Ross mc Loughlin plays the Artful Dodger with Sam Flynn as Bill Sykes and Chloe Healy as Nancy. Mr. Sowerberry is played by Ffion Anderson and Mrs. Sowerberry by Katie Moran.Jenny Darcy is Mrs Bedwin and Amber Poland is Widow Corney. Paul Coughlan , Nicole Buckley and Cian Egan also play their parts as Brownlow , Bet and Dr .Grimwig. “Oliver ” runs from Tuesday February 12 to Friday February 15 inclusive beginning at 8 pm nightly. There will also be a Primary Schools matinee. Tickets can be purchased and/booked by ringing Gallen CS. SENIOR RUGBY Well done to our Senior Team who beat Headford 33-7 in the first round of the Connacht Senior Cup. Two tries from Cathal Flynn and one try each from Harry Balsiger , Calvin Fox Keena and Ronan McDonagh saw the team power to victory. They play Athenry in the next match where victory would guarantee a semi-final spot. Thanks to Mr o Neill for his work with the team. Team – Josh Dunican , Aaron mc Cabe , John Dunican , CF Keena , Ronan mc Donagh , Adam Reams , Clive Keena , Bernard Corcoran, Dean Buckley , Marcus Keena , Dawson Maher ,Cathal Flynn , Bill Egan ,Tristan Buckley , Harry Balsiger. SENIOR GAELIC Our Senior Gaelic Team bowed out at the quarter final stage of the North Leinster B competition to a strong Ashbourne CS team in a match played in Dunboyne last week on a score line of Ashbourne CS 1-18 Gallen CS 2-11. Played with the aid of a strong breeze , Gallen helped by goals from Cathal Flynn and Enda Coughlan led by six at half time and hopes were high of a win . Ashbourne taking full advantage of the wind stepped up their performance. The sides were level with ten minutes to go but Ashbourne hit five unanswered points to win by five. Team – Adam Nugent , Colin Egan , Harry Balsiger , Colin Wren [c] Clive Keena , Aaron Brazil , Mark Cahill , Bill Egan , Kieran Guinan[0-1] , Cathal Flynn[1-4] , Bernard Corcoran [0-3] Calvin Fox Keena , Aaron mc Cabe , Enda Coughlan [1-0] Darragh Kieran Flynn [0-1] . JUNIOR HURLING Hard luck to our Junior Hurling Team who lost their third group game to Kilcormac VS 2-12 to 1-4 and bow out of the North Leinster competition. Thanks to Ms Kelly for her work with the team. 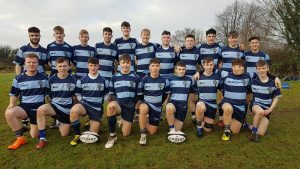 GOOD LUCK TO Our Junior Rugby team in the Connacht Cup against Headford and our Juvenile Football team in their North Leinster semi-final against Clonaslee VS and to our Ladies senior Rugby squad who play their inaugural match v’s Ballinasloe next Wednesday in Ferbane. CONGRATS TO Kate Kenny [ Offaly Ladies Football and Camogie Player of the Year 2018] and past students David Nally [ Offaly u21 hurler of the year 2018] Cian Johnson [ Offaly u 20 footballer of the Year 2018] and Dermot Daly [ Offaly Intermediate Footballer of the Year 2018].